Magazine was sold directly from our publisher. It’s sold-out. 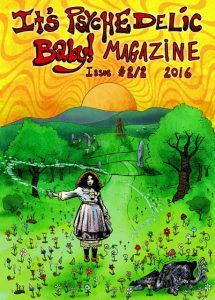 We prepared a special issue dedicated to Psychedelic Folk. This issue is divided in two volumes. First volume is full of interviews with so called “loner” folk artists coming from USA and the second volume will be dedicated to pastoral British Psychedelic Folk scene. You can find many interesting stories, that I wrote together with musicians. You can find in-depth interviews with artists such as Michael Yonkers, Dave Bixby, Dana Westover, Linda Perhacs, The Tree People, Gary Higgins and others. There’s also 10 pages with new releases reviews. Most of the content is not available on our website. 130 full-colour pages, glossy sleeve, plus bonus Space Rock/Neo-Psychedelia compilation CD! A must-have for fans of ‘Shindig!’, ‘Flashback’ or ‘Ugly Things Magazine’! Read, what Vernon Joynson has to say about it: The first Country Joe and The Fish album Electric Music For The Mind And Body is one of the very finest examples of psychedelia and when Klemen found it as a 12-year-old among a pile of his dad’s records and played it, his life changed forever. His curiosity lead him to research deeper and deeper into the whole sixties music scene. 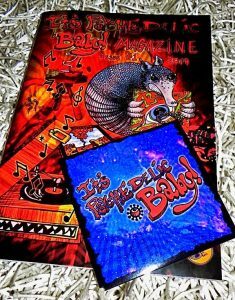 He started a blog where he discussed private pressings and over the next few years, with the help of a network of like-minded friends, the blog evolved into the fabulous online magazine that is now ‘It’s Psychedelic Baby!’. The name is perhaps a little misleading because the magazine’s scope is much wider than just psychedelia. Its scope encompasses prog-rock, jazz, blues, folk, punk, metal & avant-garde music. Indeed Klemen is a huge folk and jazz fan. Above all, the website has a special focus on obscure and rare music. At the last count this stunning site contained over 500 interviews with a very broad range of artists and people connected with the music business, as well as lots of reviews and articles. He has done so much original research, located so many forgotten artists and even helped some to find record labels. 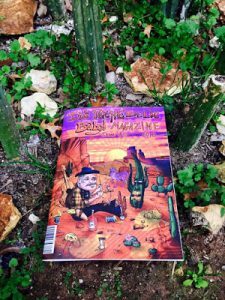 What you have in your hand is the first hard copy version of this magazine! This first edition is primarily dedicated to Texas psychedelia. The state has a very rich and diverse musical tradition, but in the sixties it produced countless tough garage-punk bands and some of the most demented acidpunk records to come out of the US in this era, as well as some seminal hippie-rock bands. Many of these were drawn to the attention of wider audiences in the subsequent years by the pioneering works of David Shutt whose ‘Journey To Tyme’ was a brilliant interpretative discographical guide to Texas 1960s punk and psychedelia and by Doug Hanners’ equally excellent magazine ‘Not Fade Away’ focusing on the Texas music scene in that era. It is largely due to them and other Texas collectors that many obscure Texas recordings of the mid to late sixties found their way onto the many various artists’ compilations of sixties punk and psychedelia that emerged in subsequent years. Now, in this new hard copy magazine, Klemen assisted by other music historians like Kevin Rathert, has traced and interviewed many more artists and the magazine contains features about Powell St. John, Zakary Thaks, The Moving Sidewalks, Lemon Fog, Golden Dawn, Homer, Corpus and many more. Be sure to read the interview with Michael Jensen (who was a member of the 13th Floor Elevators in the eighties) and shares for the very first time many stories about Roky and different meanings of some of the band’s songs. In keeping with the sheer scope of Klemen’s antenna this mag includes many other features too. He has tracked down the Zambian band WITCH and has a fascinating feature (probably the first in hard copy) about the whole seventies Zambian music scene. He’s also found Vyto (from First Chips) and there are articles on the Mexican Kaleidoscope, Bodo Molitor, Anonymous and reviews of new reissues and new psych releases. There is also a fascinating non music-related feature about “music as medicine”. Read on … I promise you will not be disappointed.